The effervescent colors, the flavor imbued curries, the strong essence of spices and the feeling of warmth. All this and more is how you’d define the magic of Indian cuisine. It offers not only brilliant flavors but a vast variety. Seeing how the Indian culture incorporates so many different cultures within it, there are so many options when it comes to food. While it’s fun to chomp on Indian food in India itself, what’s more fun is gobbling it down at an Indian restaurant in Ubud. The fun of it is different altogether. Whether you are from India or another country, here are some indian dishes you should try when you go to an Indian restaurant in Bali. A prime element of Indian cuisine in Bali, North Indian food is lip-smacking and deliciously spiced! Dal Makhani: One of the most delicious staples, dal makhani offers the most lovely flavors and a feeling of comfort. Butter Chicken: The most deliciously balanced spices and tender pieces of chicken dipped in a tomato based curry. Chole Bhature: Truly Punjabi, this filling concoction of spicy chole and fluffy bhature, make for the perfect breakfast. Paneer Tikka / Chicken Tikka: Tikkas are a sure shot way of satisfying your chatpata cravings. Paired up with some mint chutney the appetizer taste delicious. Saag: Served warm with a crispy makki di roti, the combo offers such a feeling of home. 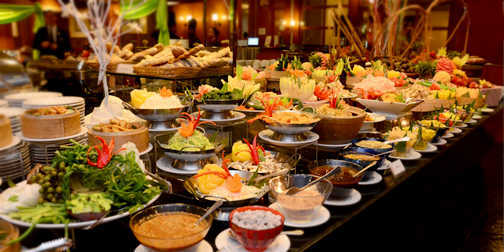 We offer all this more even at weddings, so reach out to use if you are looking for an Indian caterer in Ubud. 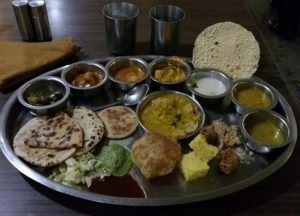 If you want to have the best Indian food, giving Gujarati cuisine a shot is a must at an Indian restaurant in Ubud. Dabeli: A perfect blend of sweet and savory, Dabeli is bread pieces stuffed with mashed potatoes and spices. It is served with some delectable sweet chutney. Dhokla: A healthy option, dhokla is rather light and not fattening at all. It’s made out of fermented rice and split chickpeas. A juicy and delicious eat, this can be paired up with either mint or tamarind chutney. Thepla: A perfect food which can be had by itself or with accompaniment. A Gujarati staple Thepla is made of wheat, spices, and leafy fenugreek. Undhiyu: A rather popular dish, Undhiyu is a mix of different vegetables dipped in a thick spicy curry. Paired up with delicious puris, it makes for a scrumptious meal. A patent in the healthy food world you have to try south Indian food in Bali. Rasam: A soupy blend of tomato, tamarind, and black pepper, Rasam offers a thin consistency and is super yummy. Paired up with crispy papads or rice, the concoction is not only delicious but good for the digestive system too. We serve it according to your spice preference so that you love your Indian food in Ubud. Sambhar: It is offered with almost every south Indian dish without even asking for it. A tasty curry with pigeon pea lentils and sesame seeds, Sambhar is a south indian staple. Masala Dosa: Made out of rice and dal batter, masala dosa comes with a generous serving of sambhar and is stuffed with a flavored potato mix. Uttapam: With a similar batter as that of dosa, the uttapam batter comes mixed with onions, green chilies, capsicum, and tomatoes. A delicious breakfast option. Idli: Light and fluffy rice cakes, idli is super easily digestible and works as a perfect pick when you want to chomp on something light. Paired with tomato and coconut chutney, it tastes delicious and can also be had with Sambhar. Go ahead and give these delicious dishes a shot when in an Indian restaurant in Bali. You’ll thank us! To know more, head to www.queenstandoor.com or Queens of India Bali, directly!